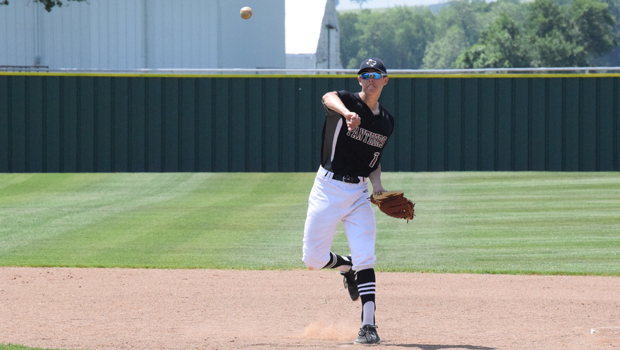 It was a battle all three games, but the Saint Jo baseball team survived a three game series against Savoy to win the regional quarterfinals and continue their season. After the Panthers came back from six runs down to win the first game on Friday 13-9, they lost the second game in extra innings 12-8 before holding on to win in the final inning of game three 3-2 to win the series. On Friday, the teams played game one at Era High School starting before noon. Saint Jo was able to strike first, but had a disastrous couple of innings to fall behind 9-3. A change at pitcher was needed and Jake Morris came in for relief. That put an end to Savoy’s offense for the rest of the game, but the Panthers needed a spark on offense to come back. They subbed in a runner for him and that runner ended up starting a comeback by stealing all of the bases to score the first of what would become 10 straight runs. Saint Jo took the lead 13-9 in the top of the seventh and was able to hold on to win as they took control of the series. Standout offensive performances came from Connor Thompson who went three for four with two doubles, four runs scored and two stolen bases. Wyatt Geurin went three for four while stealing two bases and scoring two runs. Morris did not give up a run in 3.1 innings pitched while striking out five and walking four. Game two started at 11 a.m. on Saturday, this time played at Lindsay High School. It was a back and forth affair all game. Both teams scored off passed balls in the first inning as the score was tied 1-1. The Panthers were able to score each of the next two innings to take a 3-1 lead heading into the fourth inning. The Cardinals were able to take the lead back with a big four run inning to go up 5-3. Saint Jo was able to cut the lead down, but still trailed 5-4 heading into the fifth inning. Savoy was able to extend their lead by scoring two runs in the top of the fifth as they led 7-4. The Panthers could not answer back that inning as the game went into the sixth inning. After holding the Cardinal scoreless, Saint Jo was able to double their score and take an 8-7 lead heading into the seventh and final inning. Savoy was able tie the score up 8-8 and limit the Panthers to send the game into extra innings. Unfortunately, the Cardinals had a monster eighth inning, scoring four runs to go up 12-8. Saint Jo could not answer as Savoy won the game and tied the series 1-1. Standout offensive performers where Thompson and Wyatt Geurin, who both went three for five while scoring two runs and stealing three bases. The team road senior captain Harper Roberts on the mound until his pitch count limit was up, hoping he could close out the series. This set up a winner take all game three, following game two with only 30 minutes of recuperation. Following a game that just got away from the Panthers, things easily could have bled over into game three. Saint Jo was able to strike first in the first inning, taking a 1-0 lead heading into the second inning. Brock Durham got the start and was doing a good job of keeping the Cardinals off balance. The Panthers were able to add to their lead in the third inning 2-0 as Savoy could not find a way to score. Saint Jo added another run in the fifth inning to lead 3-0 all the way until the seventh inning. Things started to go dicey as the Cardinals were able to cut the lead down to 3-2 during the inning and looked to be trying to steal the game and series in the final inning. Morris came in to pitch in relief. With two outs, Morris forced a pop up in foul territory towards first base where Roberts made the final out to clinch the series win for Saint Jo 2-1.